Around my wrist I wear a set of 73 carnelians cut and faceted in Roman workshops in the first century. They were a present from Kelley for our tenth anniversary. I am passionately attached to them. I use the plural, workshops, because it’s obvious that they are from several different times and places–different colour and clarity, different sizes, different wear patterns. Some, I think, might have been worn for a couple of hundred years; some for only a generation. They were dug up from Bahariya Oasis in Egypt, a centre of Greco-Roman winemaking around the third and fourth centuries. In other words (though no one at the gallery would admit this), they are grave goods. I don’t know the provenance, the chain of custody, of my beads. All I can tell you is they came from a respectable gallery in Australia. I prefer to believe that they were properly excavated, recorded in context, and then legally sold. But I honestly don’t know. All I know is I won’t give them up, and they’ve sparked much daydreaming. They are part of the organising matrix of my fiction about Hild. Originally, I thought I’d write one longish novel about this fascinating woman. But then I found that she wore my beads. And then I wanted to write about a woman of the 3rd century CE who also wore the beads, and a woman of the 10th century, ditto. (Rather thrillingly–at least to me–the tenth century woman is Aud the Deepminded, the historical namesake of Aud of The Blue Place and two other novels.) And the Hild novel grew in my mind to two or possibly three novels. 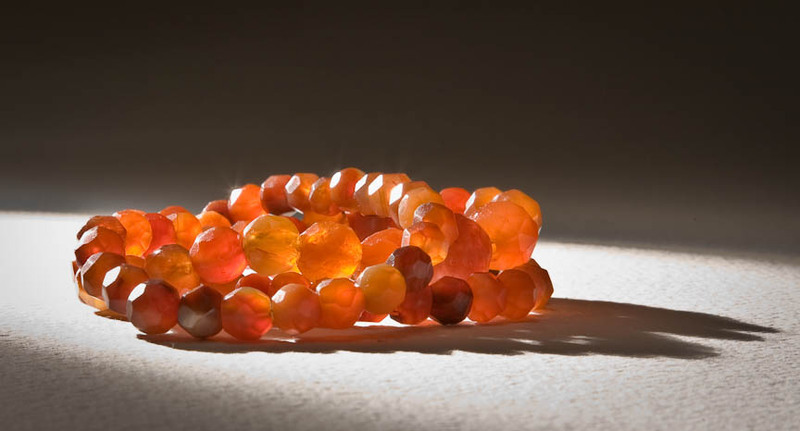 So I have a four or five novel sequence laid out in my head: the Carnelian Sequence. So my creative dance card is pretty full, just with the Carnelian Sequence. And yet, as always, I have ideas circling, waiting to land, like a skyful of planes running low on fuel: movies, tv series, stories, novels, graphic novels. Some will crash before I can land them safely, but, wow, it feels marvellous to watch them all tonight, twinkling away up there.